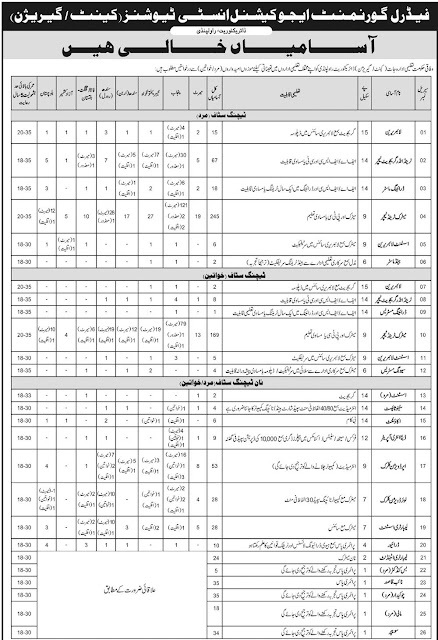 Federal Government Educational Institutions (Cantt./ Garrison) Directorate Rawalpindi announced teaching and non-teaching jobs for males and females. FGEI manages 311 schools and 44 colleges located in different cantonments of Pakistan. There are 833 total job vacancies available to apply in all provinces and territories of Pakistan; Punjab, Sindh (Urban), Sindh (Rural), KPK, Balochistan, Gilgit Baltistan, AJK and FATA. These jobs are for Teachers, Librarians, Drawing Master, Band Master, Assistant, Steno Typist, Accountant, Upper and Lower Division Clerks, Lab Assistants, Drivers and Class-IV Staff. Following is the advertisement of FGEI published in Daily Jang of November 18, 2012. It has details including province-wise vacancies, pay scales, required qualification and upper age limit. Click following image to see large view. 1. Attach attested copies of following documents along with your job application. Postal Order of Rs.100 for Sr.1 to Sr.19 and Postal Order of Rs. 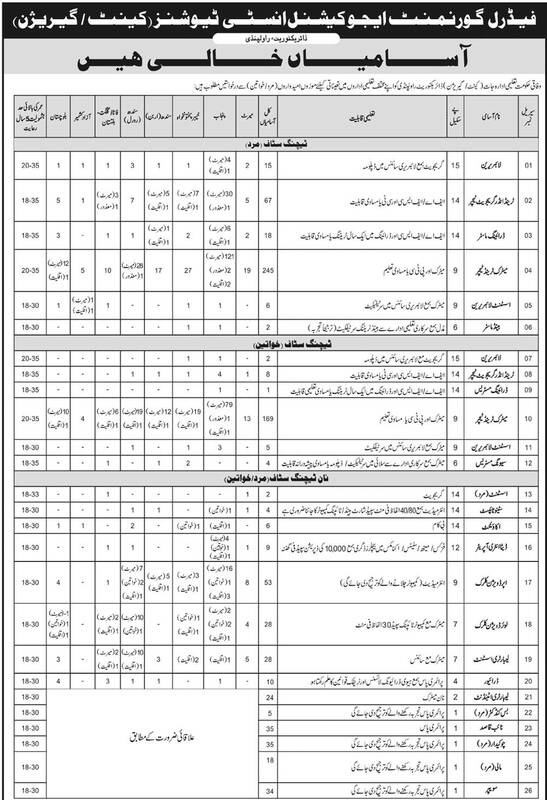 50 for Sr.20 to 26 vacancies. Postal Order should be on the name of "Director FGEI (C/G) Directorate Rawalpindi"
2. Government employees may apply through proper channel. 3. Experience applicants will be preferred. 4. No TA/DA will be applicable for test/ interview. 5. 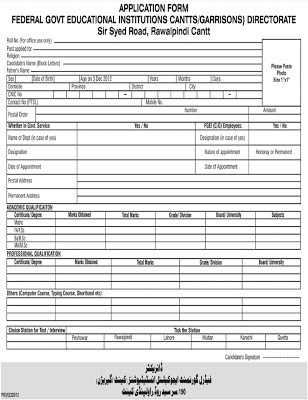 Separate application for each vacancy, if applying more than one vacancies. 6. Applications must reach on following address until 03 December, 2012. 7. Relax in upper age limit may be given according to federal government laws. Maximum 10 years to government employees who are in service from last 2 years and their age is below 55. Click on the following form to view it in full size. You can save this on your computer by clicking right mouse button on it. 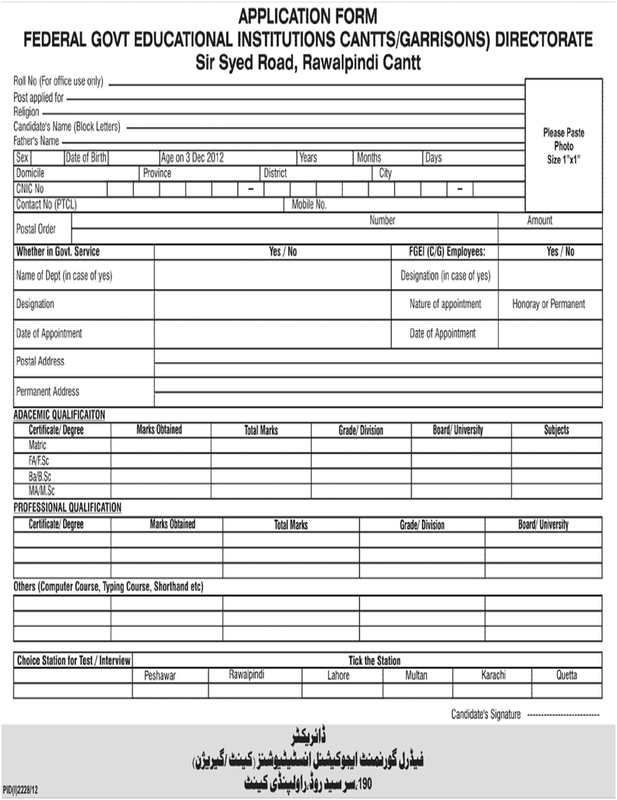 You can also create this form using a word editor program however the format must be same as per this form.